Usually the re-release of old classic games are a bit of a let down. I bought Ker-Plunk a few years ago - a game I had only played once in the '80s and really enjoyed. So, when it was reissued a few years ago I leapt at the chance to buy it. Sadly I felt cheated! The game was more lightweight than the original and the casing that held the straws was very temperamental and would fall apart at the critical moment. Not only that, but there were too few straws and the balls were too small, which meant that the game was over minutes after it had started. Thankfully F.E.V.A have not only reissued a classic game, but actually improved upon it. 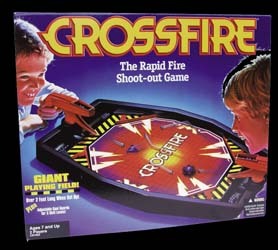 Crossfire was one of those toys, like Ker-Plunk, that I never owned myself on its original release - although I did play it a few times. This re-released version has a much larger playing arena, two different shaped pucks for you to get into your opponent's goal, and an adjustable goal mouth to make scoring that much harder. This also levels the playing field if an adult is playing a small child - allowing the weaker player an advantage. At £18 you can't get much more fun for your money and it will get adults and children equally excited - I know, we tried pitting some young children against some 40 and 50-somethings. The only real downside (or very small complaint) is that you are really going to have to play this on the floor. Don't even think of putting this on a table as the ball bearings go all over the place (when they hit the pucks or another ball bearing, they have a tendency to launch themselves off the board and across the floor. This is not so bad if you are stationed on the floor, but on a table you'll be scrabbling around on your hands and knees for quite some time. If you hark back to the days when you had a Chopper bike, watched Starsky and Hutch on the telly and had no idea what a Playstation was... then you need this game to enrich your life. And if you want a mindless game to play with the family this is ideal. 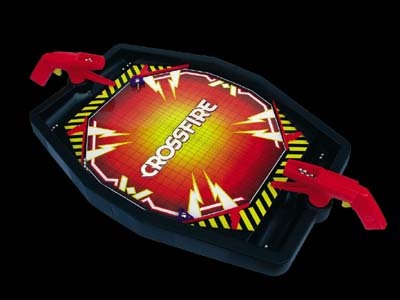 Whatever way you look at it the new and improved Crossfire is a real winner.